Patrick James Eggle is without doubt one of the most respected guitar-builders in the UK, if not the world. Although producing guitars under his own name for some 30-plus years, he has long been associated with Faith Guitars. His influence over design, tonewood choice, quality control and setup has resulted in Faith’s undeniable reputation for producing high-quality guitars at a wide range of price points. Recent times, however, has seen Eggle switch from acoustic to focus on electric guitars. 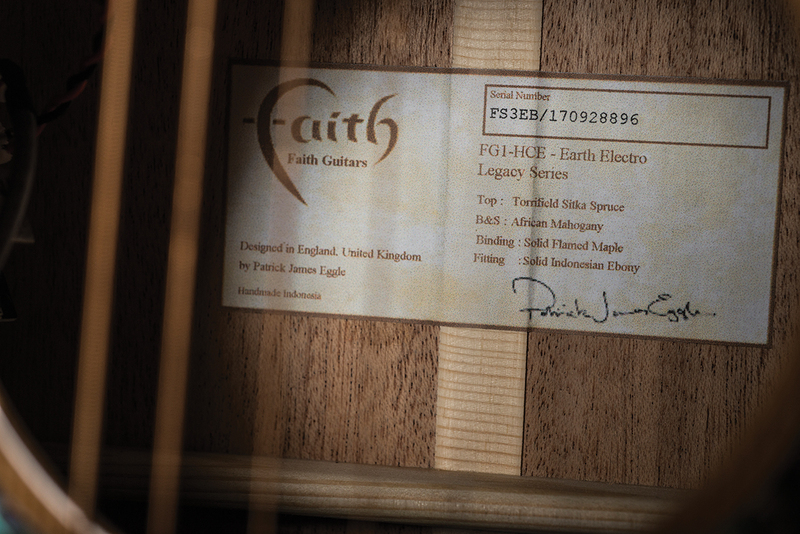 In an effort to ensure that his work remains on the radar, however, Faith has released the PJE Legacy Series of guitars. Each of the three models in the range are based on Eggle models. The Legacy Mars is a drop-shouldered Dreadnought based on the PJE Kanuga. 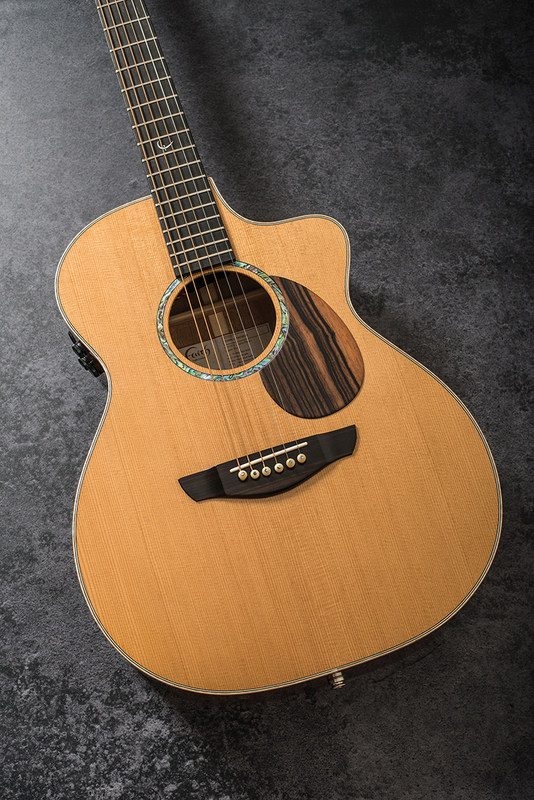 The Legacy Neptune is described by Faith as a ‘baby jumbo’, akin to the PJE Saluda, while the Legacy Earth is a cutaway Orchestra Model. 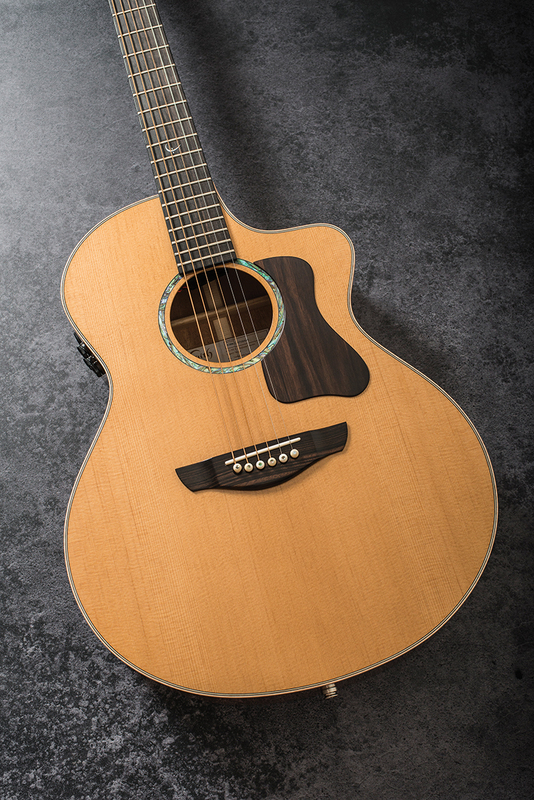 This particular model is a new body shape for Faith and harks back to the PJE Linville (which, in this reviewer’s opinion, was the best guitar Eggle ever made). Though each model has a distinct body shape, there’s much commonality across the range: so let’s first look at the features the stablemates share. All three guitars are constructed with solid African Khaya mahogany back and sides, with torrefied Canadian Sitka-spruce tops. First employed by the Vikings, torrefaction, or torrefaction as its sometimes referred to, is the process where wood is baked or roasted in a controlled environment to replicate the natural aging process wood goes through over time. As wood ages, individual cells lose their ability to retain moisture – which is why a guitar from, say, the 1930s, is much lighter and vibrant than a newer guitar. 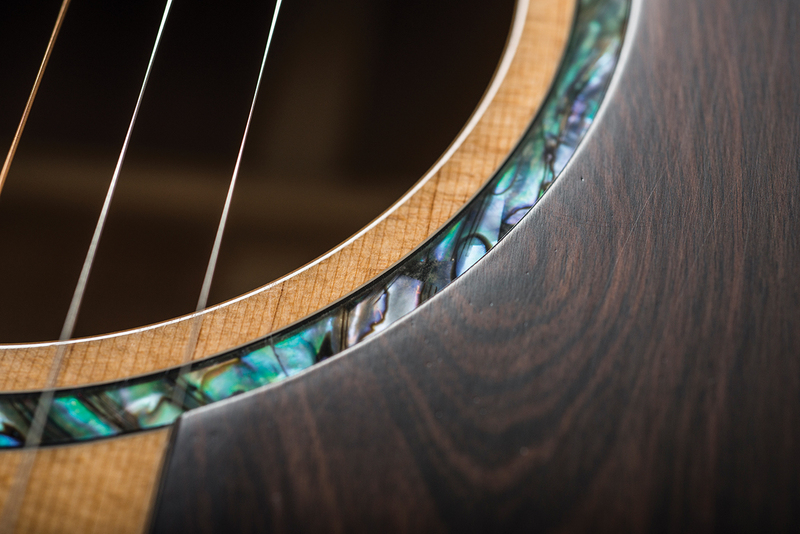 The ‘drier’ wood is more able to vibrate, has far more resonance, and offers a more mellow, mature tone as a result. Other common features include a C-shape mahogany bolt-on neck, natural bone nut, saddle and bridge pins, flamed-maple binding and Macassan figured-ebony fingerboard, headplate, bridge and pickguard (the first time Faith has offered a pickguard-fitted guitar!). 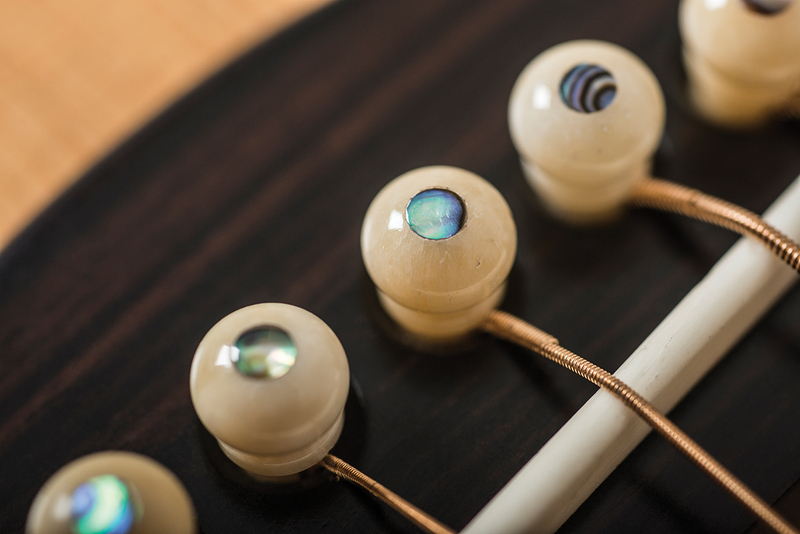 The Legacy series also boasts abalone soundhole rosettes, and Grover 18:1 nickel-plated tuners with ebony buttons. All the bodies have a high-gloss lacquer finish, 45mm nut width and are loaded with a Fishman Flex Blend pickup system, which combines an under-saddle pickup and condenser mic. Finally, the Legacy series comes with an impressive ABS, carbon-fibre-effect deluxe hardcase finished with scarlet-red lining and five clasps (one lockable). Inspecting each model more closely, we’re impressed with the grade of respective tonewoods used. 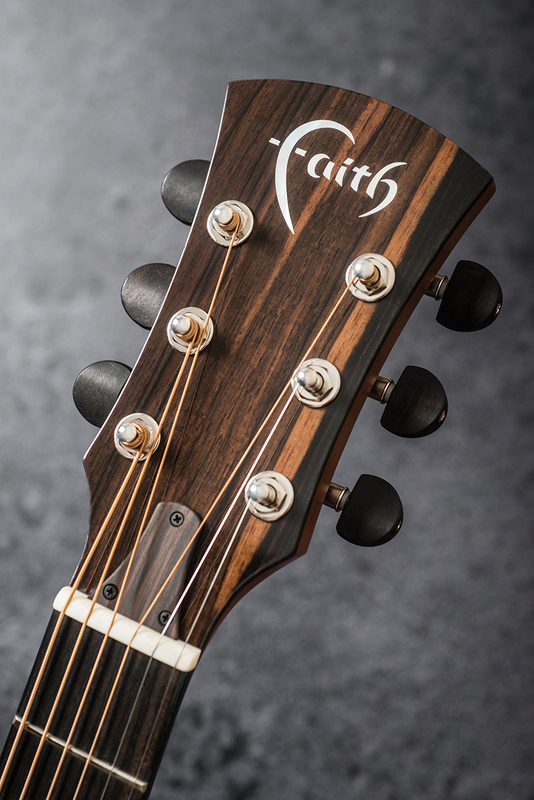 The African Khaya mahogany has a slightly tighter grain than the Indonesian mahogany usually used on Faith models. 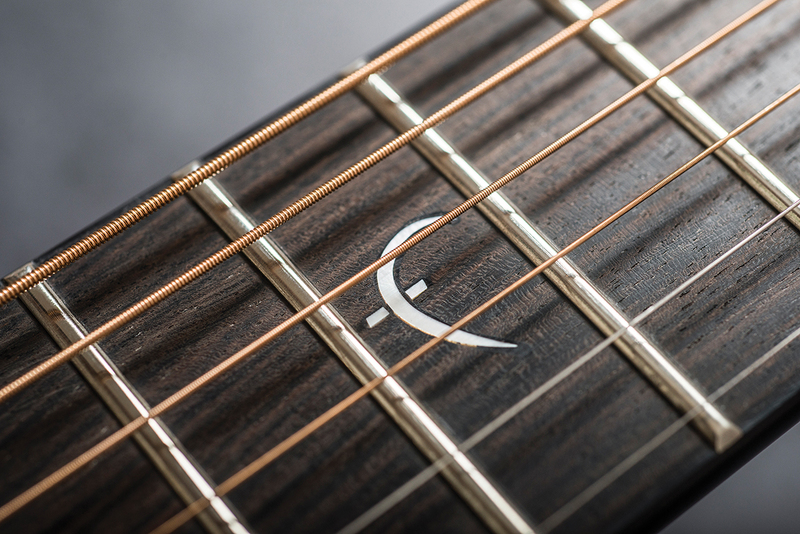 The tighter grain means increased stiffness, and therefore the back and sides can be machined a touch thinner, increasing the body’s ability to resonate. The Sitka-spruce top is also a high grade, with a ruler-straight grain. We particularly like the golden hue the torrefaction process has given the tops. The Legacy reinforces Faith’s existing reputation for exceptionally high standards of construction, finish and presentation. Inside and out, each guitar here on review is immaculate. Frets are flawlessly finished, joints are tight and clean, and we’re particularly impressed with the quality of the all-gloss finish which, although perhaps a tad thick for some, is as good as any guitar at this price point. In terms of their looks, the guitars are obviously very similar. 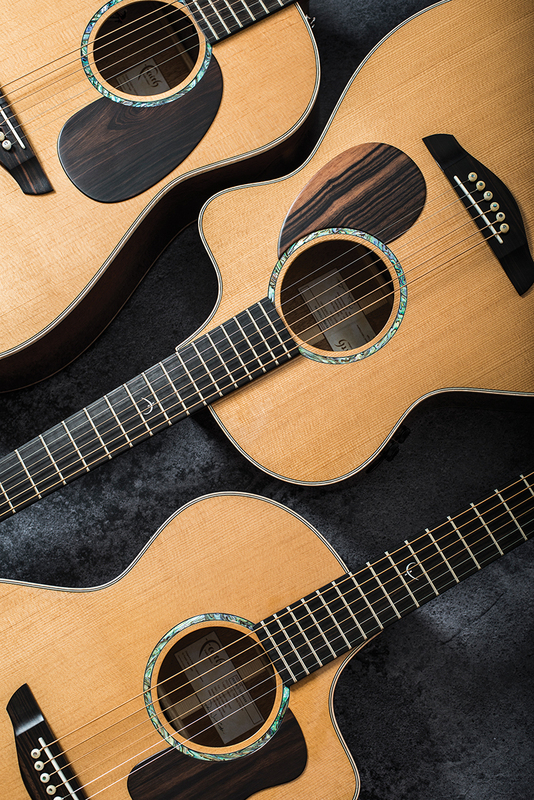 Clean, slick lines give a contemporary feel – particularly so with the two cutaway models. The Mars Dreadnought, however, is an intriguing marriage of old and new, as we’ve become accustomed to slope-shouldered Dreads most often having a vintage, pre-war feel. The modern-day presentation combines well with the slope-shoulder form. As mentioned, the onboard electrics come in the form of the Fishman Flex Blend system, which couples an under-saddle pickup with an internal condenser microphone – the respective signals from each can be blended together. The three rotary controls for the system are fitted to the upper shoulder: tone, blend and volume. Pressing and holding the volume control engages the chromatic tuner, at which point, the signal is muted. The Flex Blend is a good system and we like the fact that the guitar doesn’t need to be plugged in for the tuner to be engaged. We also appreciate that the backlight of the tuner switches from blue to green once correct pitch is achieved – a handy feature for dimly-lit stages. Again, staying with the commonality the models share, Legacy-series guitars have a low-action setup – very low, in fact. The guitars are just on the right side of buzzing – electric players will feel particularly at home here. The guitars’ setup is great for normal, everyday strumming and fingerpicking, but if you dig in and push, you can get a ‘zing’ and ‘snap’ from the guitars, which, if handled right, can be a welcome addition to the tonal options. When plugged in, the Fishman Flex Blend is a capable and versatile system. The tone control provides enough variation to be really useful, but we’d have liked to see some markings or a centre indentation on the rotaries. If you’re the type of musician that just sets everything to 10 and goes, it’s no problem, but for those that like the variation the controls offer, it’s easy to lose where you are. As you’d expect, the dreadnought has the beefiest output of the trio. 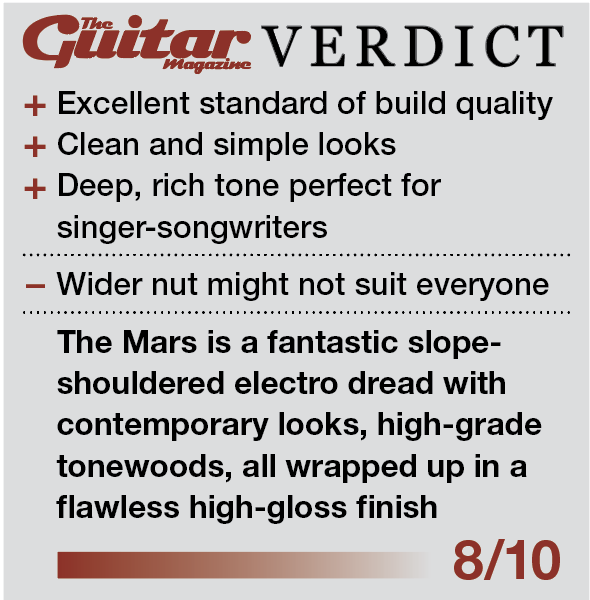 Full of depth and bottom end, the Mars is a strummer’s delight. The nut width is very marginally wider than a regular dreadnought’s dimensions (say, a Martin D-18). Surprisingly, the extra millimetre does feel like it makes a difference, but not so much that it’d put anyone off. It just takes a song or two to adjust your playing. 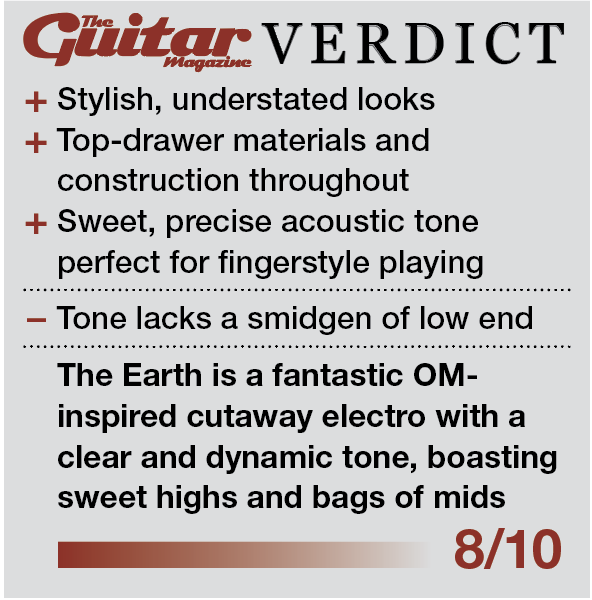 The Earth OM on the other hand produces a timbre from the other end of the tonal spectrum, with precise highs and a sweetness that only comes from medium- and smaller-bodied guitars. When compared to a Martin OM, the Earth has nearly a full centimetre of extra depth; which certainly helps with projection and increased volume. 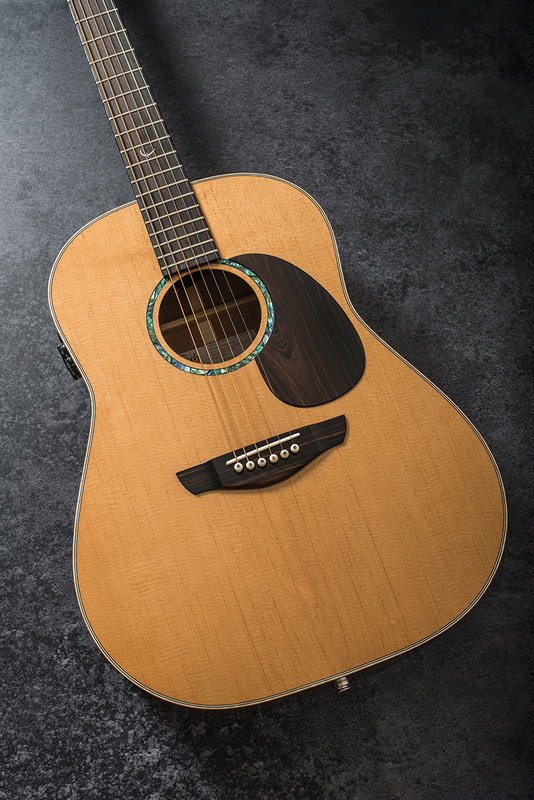 If the Mars dreadnought is for strummers; the Earth OM is more at home with fingerpicking duties, due to its defined, detailed performance. The Neptune, described as a mini-jumbo in its body size, sits somewhere between its siblings, tonally speaking. 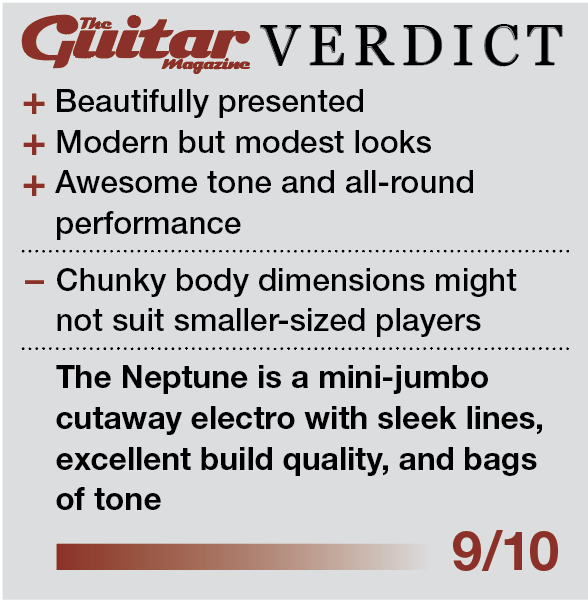 Capturing the best of both worlds, the Neptune combines precision with boom, and we’d suggest that this particular model would be well suited to an all-rounder, that is someone who plays a bit of everything and, for this reviewer at least, feels the most versatile and adaptable. The Neptune handles strumming, soloing, choppy riff work and fingerpicking admirably and we’d suggest is the pick of this Legacy bunch.